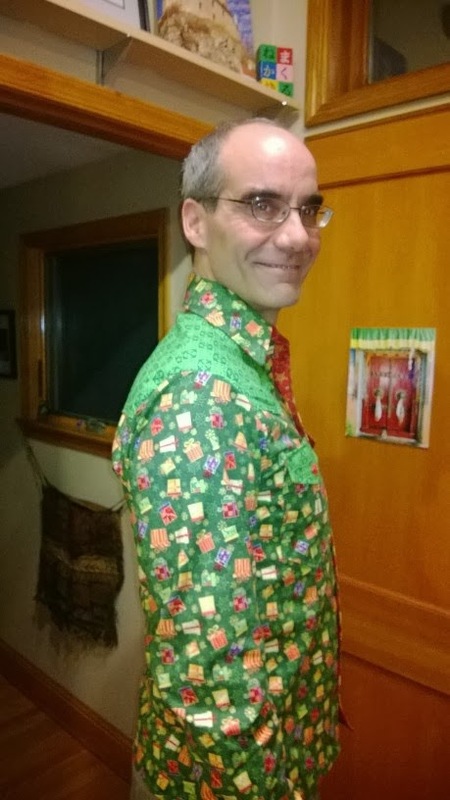 Obviously the Roommate's Western Xmas Shirt is finished! Here is the supermodel showing it off. Apparently I'm even luckier than I previously thought, because at least 2 friends have told me their significant others would never wear anything like that. The Roommate is an elementary school teacher and the children love him, partly because he does not mind looking silly...so even if the crazy shirts I make for him are not sophisticated or classy, he wears them anyway, with pleasure. 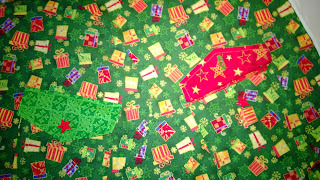 You can see that I had fun w/ the contrasting red & green. 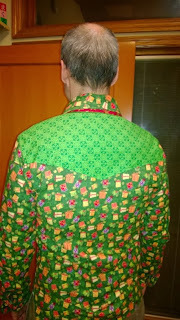 The red is under the collar, and inside the neckline & the button placket, so it just shows a bit. I also included some red inside the pockets & red star buttons--because the Roommate is also a communist! ;-) For those detail pictures, click here. The pattern is Simplicity 6693, from 1974, BTW. The Roommate is getting yet *another* fun shirt. He picked out the fabric, and I got it cut out last night. 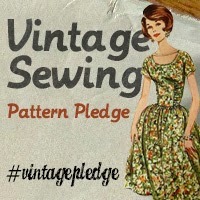 I'll mark the pattern pieces today & get started sewing. 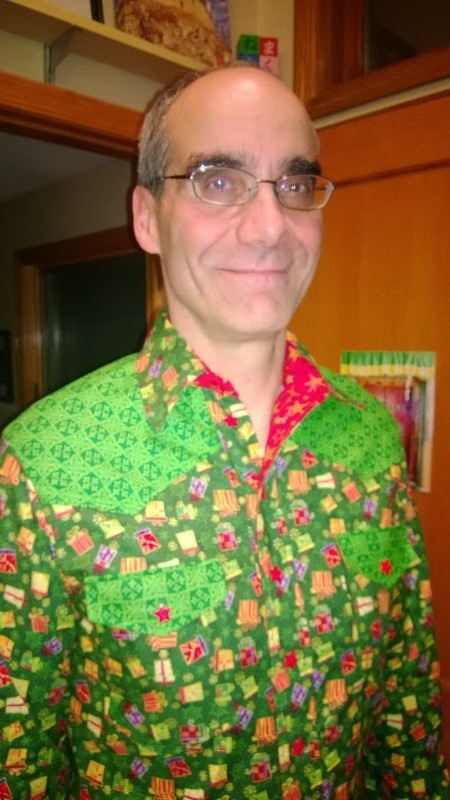 It won't have pearlized snaps, like the Western African shirt had. Instead, I bought red star buttons. The contrasting fabric for the cuffs & the yokes is great, too. 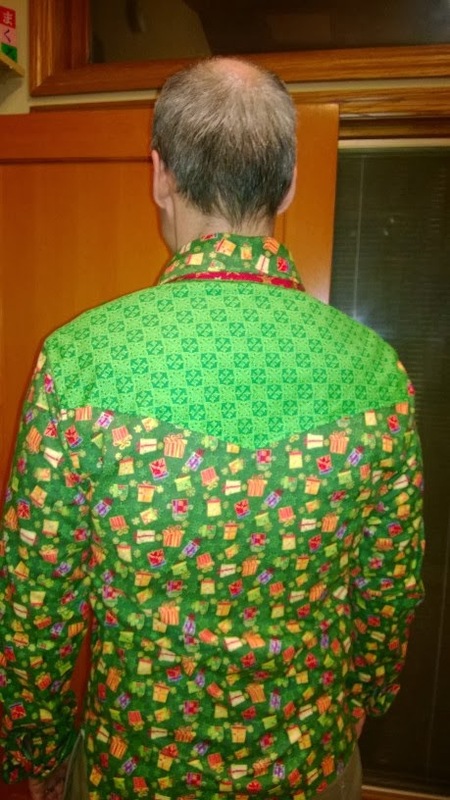 I did the pockets first. On the right you can see the flaps (left is buttoned, right is open with the red contrasting on the underside of the flap). I can't wait to show it to you! Music? How about Back Door Santa, Clarence Carter! We got a lovely blast of snow and ice today, so it feels a lot more like xmas & makes sitting in front of the fireplace, reading with Bella (who has kept me focused on sewing all day, in managerial fashion), a lovely proposition. Of course, it's Sunday and not having to go out in it helps...it feels romantic & cozy & fun. I don't work tomorrow, but the Roommate does, so this won't be so fun tomorrow for him, driving to work, especially if we have a true ice storm as they're predicting tonite. So after we ran out to the gym & to get some supplies (milk, limes! 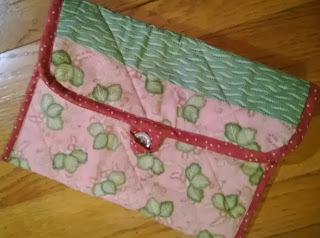 ), I got one of my projects done, a quilted iPad holder for my sister (who doesn't read this blog, so my secret should be safe). 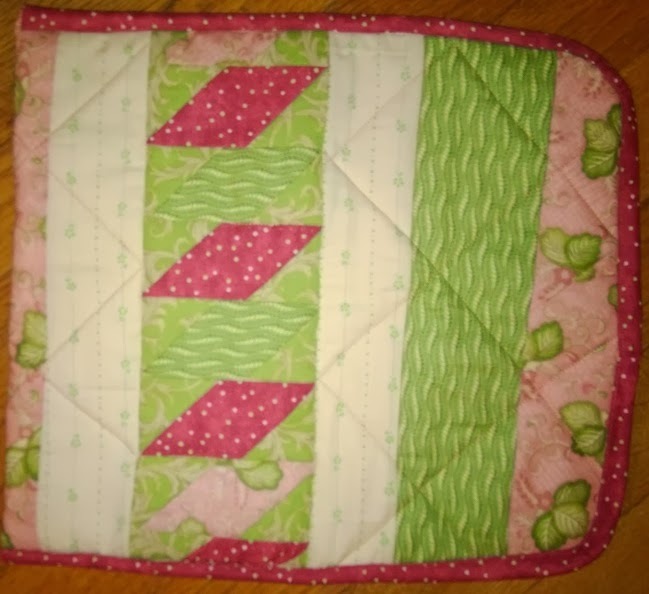 I did a bit of piecing, and decided to curve the edges of the front flap because I couldn't find my instructions for making a mitered corner for the binding. 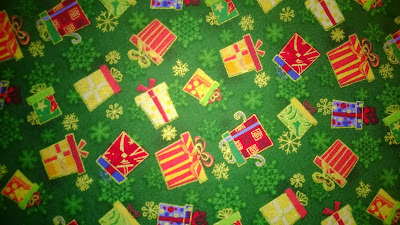 I could have looked it up on the innerwebs, I know, but decided this made it a bit softer & worked better with the pretty fabric. 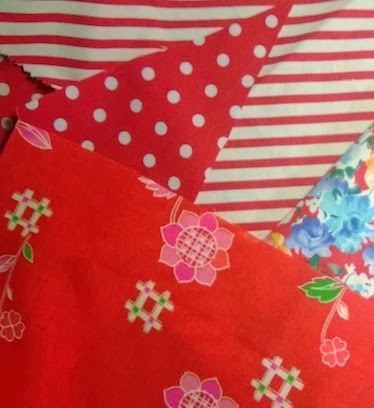 I think most of this fabric was a gift from a quilting friend, but there were so many different colors that matched & mixed, so I think parts of it were serendipitous, too. No complaints; it was nice to work with such pretty fabric, and to have lots to play with. I also managed to get caught up on my Project Runway Allstars episodes. Sometimes I feel like I spend more time trying to find something to watch while sewing than I spend actually sewing! 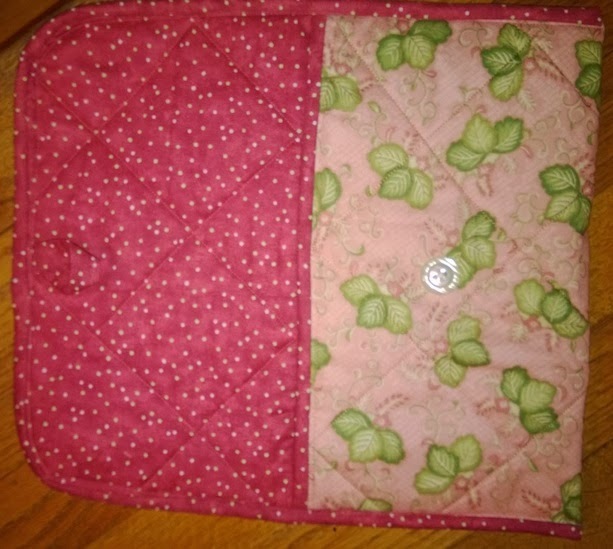 This is the outside back of the tablet cover. What are you making for xmas gifts? The main fabric in this photo is a panel from a girl's kimono...it's silk and I bought it in Japan years ago. I've been waiting to use it, and the time has come. I'm also using up some scraps (given by a generous freecycle member) & a bit of other cotton stash items for this gift. I won't say too much more about it because one of the giftees reads this blog. I have also been doing a bit of knitting (also for xmas), and am still trying to finish the cotton test run for the wool jacket, the half of See & Sew B5699 that I haven't even started on! Realistically, I probably won't get all this done. For one thing, we'll be away for xmas & we both work full-time until then. Meaning, between packing, cleaning, doing laundry, wrapping presents & working on xmas cards, we'll be pretty darn busy. Not to mention the gym! But I'm doing my best, & if some doesn't get done, oh well. 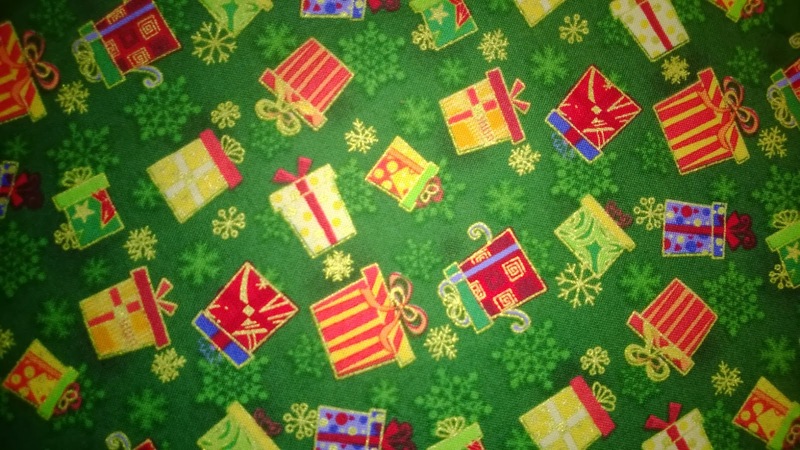 What are you doing to prepare for the holiday season? Gift-making, gift-baking? Will you get it all completed in time? !